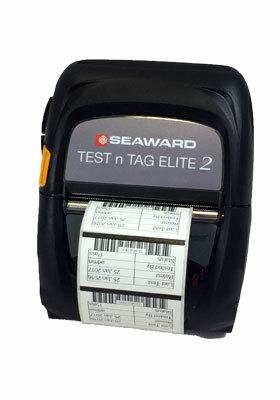 Rigel’s Test ’n Tag Elite 2 printer is a unique accessory that provides you with print-outs of test results and pass/fail barcode label’s. Battery powered and housed in a rugged rubber enclosure, the Test ‘n Tag Elite 2 printer can be safely used in the most demanding of environments. Test results can be printed on the standard 50mm wide paper rolls. Offering 4 different designs to suit your requirements, the Test n Tag Elite 2 labels can be customised, which includes a provision to add your own design logo and phone number to each label. The barcode labels are printed on thermal transfer coated labels which make them not only tamper proof but also protects them when being cleaned.